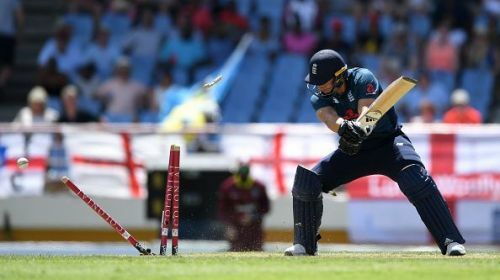 With England's latest capitulation at Gros Islet, being dismissed for 113 and handing a rejuvenated West Indies side an ODI series draw, there is much to take away and dissect. Mere days after racking up one of their highest ODI scores of 418 by showing a non-stop aggressive approach, this latest poor effort shows both a lack of application and a distinct lack of direction where the team is concerned. The West Indies on their part have undoubtedly shown a much more improved effort throughout this ODI series, after pouncing on a shell-shocked England to trounce them in the proceeding Test series. Yet it is England who have failed to adapt as this torrid tour has rolled on. Their main issue is the complete inability to switch gears when conditions aren’t going their way. Indeed, whenever they were put under consistent pressure by the West Indies pace attack, both early and in the middle of their innings, they completely crumbled. If England cannot learn to adapt when necessary in the limited opportunities before this year's World Cup, then maybe they aren't as huge favorites to lift the trophy as many believe. Teams such as India, Pakistan and New Zealand have shown in recent fixtures that an all-out aggressive approach, of which England are so fond, is not the blue print required to taste sustained success - especially not in pressure situations. And you can bet that the World Cup 2019 will throw up plenty of pressure situations. A much more controlled approach is required to build scores of note game after game. A greater emphasis needs to be placed on working into the first 20 overs with a sense of maturity and composure, before hitting out with gusto if the conditions are suitable in the closing stages of the game. New Zealand and India have shown they can implement this plan week in week out. On the other hand, England just swish away from ball one with no regard for conditions or indeed respect for the opposition bowling attack. England captain Eoin Morgan is one of the few batsmen in the current ODI set-up who has proven himself capable of switching gears and adapting when required. It is with his fellow top and middle order batsmen where the underlying issue lies. Players such as Jason Roy, Ben Stokes and Jonny Bairstow are extremely talented, and have shown glimpses of consistency with the bat in hand. The problem is that unlike their skipper, they are more boom-or-bust than caution and caress. And the latter qualities are more likely to give their World Cup chances a boost than the former. There is certainly scope in modern ODI cricket to apply an all-out attack on a hapless or careless side; just ask Chris Gayle. But as Gayle himself showed throughout this series, there is a time and a place to do that. One senses that England will learn some harsh lessons from their latest batting collapse, and to be honest they have to. With time running out before a home World Cup in which they are so favored, they must take a good look in the mirror to decide who they want to be. More importantly, they need to ask themselves if they can manage to adapt and find the consistency that is required to take home the chocolates.